BANKRUPTCY IS A FUNDAMENTAL RIGHT THAT IS GUARANTEED UNDER THE CONSTITUTION. If you are caught in an endless cycle of debt, it is not your fault. Exorbitant interest rates on credit cards, medical bills and job loss are a few of the many reasons that cause financial hardship and can happen to anyone. A few unfortunate events can lead to a cycle of debt which quickly becomes impossible to overcome. But, you do not have to continue to drown in debt. The law offers a solution by providing a way for you to eliminate some or all of your debt. 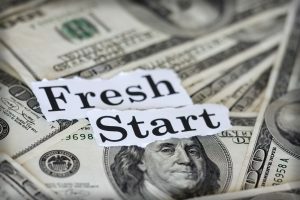 Designed to provide honest but unfortunate debtors a “fresh start”, bankruptcy protection is a powerful tool which can allow you to clear insurmountable debt and begin rebuilding your credit. If property does not fall into one of the above three categories, it will be sold by the U.S. Trustee. Typically, chapter 7 cases are “no asset” cases, meaning the debtor(s) has/have no property which will be sold. There are various reasons property is not sold. Real property (e.g. your home) is often fully or over mortgaged. The trustee will not sell this property because there will be no money from the sale with which to pay off creditors. Where there is equity, the property can often be claimed as exempt. State law provides for various exemptions which allows for people to keep property if they were sued in State court. In California, there are two sets of exemptions (State and Federal) and it is important to find a law firm which can help you best choose the best set for your situation. Personal property is typically not sold because it has little or no value. Household goods, pets, pictures, and costume jewelry are all items which are highly unlikely to be sold. Debts which are reaffirmed. Bankruptcy allows for certain debts (e.g. car loans or loans from family members) to be “reaffirmed”. Reaffirmation is a process whereby you can agree to continue being responsible for a debt which would be otherwise discharged by the bankruptcy. Choosing to reaffirm a debt is complete voluntary, although payments will likely need to be made in order to retain property post-bankruptcy even if the debt is not reaffirmed (e.g., if you have a car loan and do not reaffirm the debt, you would likely need to make payments post-bankruptcy or the lender will seize the car). Secured debts. These are debts which are secured to property such as your home or car. While the debt is technically eliminated through bankruptcy, payments to the lender will be required in order to retain the property post-bankruptcy. Compliance with the bankruptcy court’s requests for information and financial records is essential to one’s ability to discharge debts. If the court finds a debtor to be non-cooperative, discharge may be denied. Filing for bankruptcy will immediately stop all collections, wage garnishments and lawsuits. Upon filing, an automatic court order is entered which places into effect the “automatic stay”. The automatic stay prevents creditors from collecting on a debt in any manner—that is, they may not call, write, e-mail or in any other way contact you or any other person to collect on any debt. In 2005, the credit industry convinced Congress that too many people who could pay their debts were filing for bankruptcy instead of doing so. The result was the requirement that debtors pass the “Means Test”. If your household earns less than the average household of your size in your area, then the Means Test does not apply. If your household earns more than this average, the Means Test must be performed. The Test essentially compares your household’s income and expenditures with standards set by the IRS. If the Means Test is not passed, a presumption arises that you can pay back your debts. However, the inquiry does not end there and special circumstances can convince a judge that you qualify for bankruptcy despite the presumption. This depends on a variety of factors, including what your score currently is, what chapter you file for, and if you successfully complete your bankruptcy. While filing for bankruptcy may lower a credit score, it will not necessarily do so. In fact, if you already have a low credit score, filing can actually increase your score, especially after successful completion of a Chapter 13 or Chapter 11 bankruptcy plan in which you pay off some of your debt. Chapter 7 bankruptcy can also, in certain instances, increase a low credit score, after successful discharge. It is also important to know that you can always re-build your credit after bankruptcy, and ANAND LAW can guide you on how to do so. In order to understand the unpredictability of how bankruptcy may affect your credit score, it is helpful to understand how credit scores are calculated. Credit bureaus (also known as “credit reporting agencies”) act an intermediary between consumers, businesses and lenders. The credit bureaus collect data from various sources, and then use this data to create your credit score. The bureaus use third-party companies, each who employ their own methodology, to calculate these scores. There are dozens of credit reporting agencies, but the three national agencies that a majority of lenders and businesses use are Experian, Equifax, and Transunion. Similarly, there are many credit scoring companies, but the two most common are FICO and VantageScore. Experian Equifax and Transunion came together to create VantageScore, and all continue to use them to generate credit scores. The credit scores are based on how the various data collected interacts with each other. There are approximately 220 million consumers that credit reports have been created for, and approximately 36 billion pieces of credit data utilized in credit reports every year to create the credit scores (source: VantageScore). The exact methodology used is complicated and uncertain, but factors include: payment history with lenders, banks, and credit card companies; amounts owed; length of delinquencies; length of accounts in good standing; and, types of credit being used. Scores from each bureau may differ for a variety of reasons, including the timing of the data provided. Regardless of the credit bureau (e.g., Experian, Equifax, or Transunion), or the scoring agency (e.g., FICO or VantageScore), you can improve your credit score, no matter how bad it is, and no matter the reason for it being low (whether due to bad payment history, repossessions, judgments, liens, foreclosure, or other). In general, you can improve your credit score by using credit (e.g., through a credit card, line of credit, or loan), and paying bank all use of that credit on time. The longer you consistently pay on time, and the higher the amount of credit being used, the better your credit score will be. You can re-establish your credit even after repossessions, judgments, liens, or foreclosure by maintaining a pattern of using credit and repaying the lender timely. There are lenders willing to extend credit to nearly anyone, regardless of their score, and even lenders that extend credit to individuals in active bankruptcy proceedings. However, it is important to note that, in general, the lower your credit score, the more it will cost to obtain the credit (i.e., the higher interest rate you will receive)–this makes it even more critical that you pay on time. The bottom line is that it is not hopeless–with some patience and organization to manage your finances, you can re-establish and build your credit score. What Kind of Property Can I Keep in a Chapter 7 Bankruptcy? Typically, debtors in a Chapter 7 bankruptcy are able to keep property that is exempt, fully encumbered with debt, and property that has no value or cannot be sold. Exempt property is property (up to a certain value) that a creditor cannot take. California has two sets of exemptions and the Bankruptcy Code also includes a set. Fully encumbered property is property that has liens or mortgages which are equal or greater to the value of the property. The trustee does not want this property because they will not make any money after selling the property and paying off the liens. You may keep this property as long as you are current on payments. If not, the creditor will take the property. Will I Be Able to Get Credit After the Bankruptcy? The fact that you have filed a bankruptcy will not prevent you from getting credit. While you should expect getting credit to be more difficult and expensive, there are actually many lenders that target people recently discharged from a bankruptcy since they have no other debt, are ready to establish their credit and they can’t file for bankruptcy any time soon.